Next time you go out to a rock club or casino to hear some '50s R&B sounds of The Platters or The Drifters or The Coasters, there's a chance that other bands passing themselves off as The Platters or The Drifters or The Coasters are playing in Nebraska and South Carolina and maybe Oregon at the same time. It's an old trick, but sometimes it works. And it's been working for several years. Basically there are unscrupulous music promoters who organize several touring groups under the names of bands who had big hits in the 1950s. And they bill themselves under the name of these groups even though none of the musicians you see on stage ever had anything to do with the original band. But that could come to stop if House Bill 934 — the Truth in Music Advertising Act — becomes law. The House on Wednesday passed it with little discussion by a 57-6 vote. Rep. Al Park, D-Albuquerque, is the sponsor of the bill. 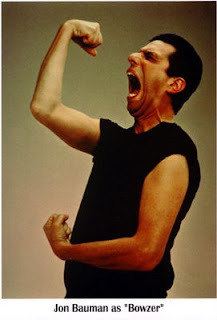 But the real power behind it is someone who has performed '50s and early '60s music on stage for years — Jon Bauman, better known as Bowzer from the band Sha Na Na. Bauman is the head of the Vocal Groups Hall of Fame Truth in Music Committee. "It's the vocal groups who are mainly impacted by this, which I consider a bizarre form of identity theft," said Bauman in a phone interview Wednesday. He said the practice hurts the ticket-buyers, who believe they are paying to see actual rock 'n' roll heroes. It hurts the venues, who believe they are getting a good deal on brand-name groups. But most of all, Bauman said, it hurts the original artists, people like Carl Gardner of The Coasters and Ben E. King of The Drifters, who are still alive and trying to make a living by performing. Bauman has been traveling to various state legislatures pushing similar bills. According to news accounts, he's recently been in Oklahoma and Washington to lobby for the bill. Bauman was in Utah this week, where The Salt Lake City Tribune reported he ended his talk to the House of Representatives by slipping into his Bowzer character and launching into "his signature doo wop, ending with a bass-note 'thank you.' " The Utah House passed the bill unanimously. Bauman, who now performs with a band called Bowzer's Rock 'N' Roll Party, hopes to be able to make it to Santa Fe when HB934 starts moving through the Senate. The bill has been assigned to the Senate Judiciary Committee. Gimme the truth: According to a fiscal impact report, Park's bill would make it illegal for anyone to advertise or conduct a live musical performance or production in New Mexico "through the use of a false, deceptive or misleading affiliation, connection or association between a performing group and a recording group." Those violating the act could be fined between $5,000 and $15,000. Under the law, the attorney general or a district attorney could file an injunction to stop a performance. So far that hasn't happened, Bauman said, though there have been cases in which the promoter was forced to advertise the show as a "tribute" to the band being impersonated and offer money back to ticket-buyers who thought they had paid to see the real group. Elvis impersonators and "tribute bands" — the kind you see advertised that specialize in the music of The Doors, The Grateful Dead, and Creedence Clearwater Revival — would not be affected by the measure, as long as the advertising didn't imply it was the real band or singer playing. Who reports that an impostor is playing? Bauman said there's a loose-knit group of diehard '50s music fanatics who are always on the lookout for such advertising. The fiscal impact report says 17 other states have passed similar laws. Bauman said the correct number is 27 states. The number of shows by phony bands has significantly dropped in states that have passed the law, Bauman said. Will it pass the New Mexico Senate? It took umpteen years to get rid of cockfighting and we were one of the last two states to outlaw it. There might be those who don't mind the fact that New Mexico could be the last bastion of phony doo-wop groups. The Fabulous '50s: There has been at least one impostor band passing themselves off as the '80s band Frankie Goes to Hollywood, Bauman said. There was a case of phony Temptations, whose claim to the name was the fact that one member had been a sideman for one of the later incarnations of the famous Motown group. It's the relatively anonymous doo-wop and R&B groups who were the pioneers of rock 'n' roll who have been hurt the most. "Obviously you couldn't do this with the Beatles," he said. "You couldn't do it with U2." Back before the days of racial integration, record companies often would release albums without the photos of black artists, he said, for fear it would hurt record sales. The trick, Bauman said is to have a band of younger musicians with one singer in his late 60s or 70s. That's what Bauman sardonically calls "The Real One." "People will see the older guy and think, 'Hey that's the real one.' "
Of the real "real ones," Bauman said, "These were the pioneers of rock 'n' roll. They were the pioneers of a movement whose music, I believe changed this country. I'm doing this as a type of public service." Here's Bauman/Bowser testifying at a committee of the California State Assemby two years ago. Senate Votes to Open Conference Committees! Death Penalty Debate Friday Morning? Death Penalty Bill in Senate Today?